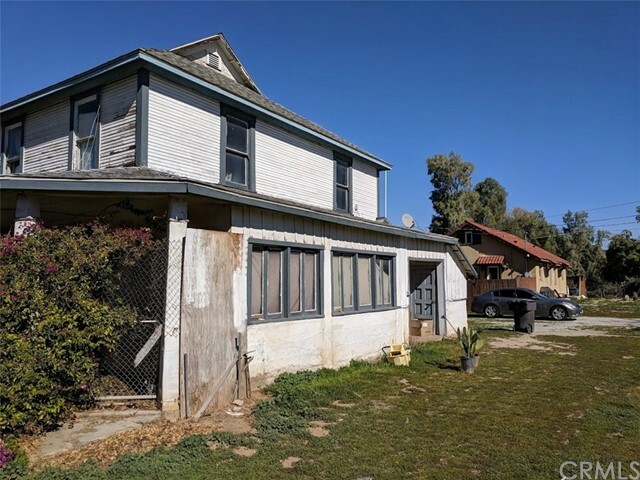 All Riverside homes currently listed for sale in Riverside as of 04/21/2019 are shown below. You can change the search criteria at any time by pressing the 'Change Search' button below. If you have any questions or you would like more information about any Riverside homes for sale or other Riverside real estate, please contact us and one of our knowledgeable Riverside REALTORS® would be pleased to assist you. "Take the beautiful tree lined driveway to the top of this 27 acre estate home. 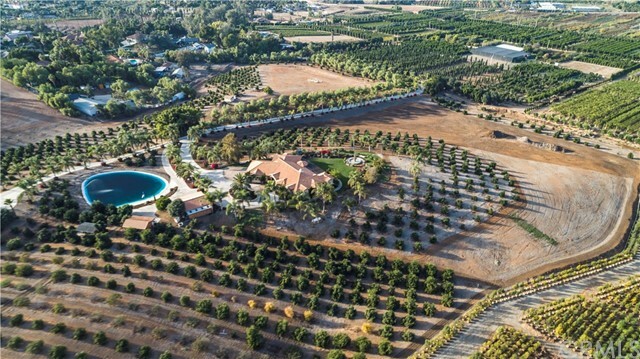 Property features multiple residences, citrus & avocado groves, over 1700 mature trees, ponds, fountains, state of the art technology, security system, Automatic Watering & Moisture Sensing Irrigation System, Automatic Fertilizer Injection System & solar. Property has 360 degree views of Riverside, mountains, city lights, nurseries & groves. Main residence is 5699 SF w/ exposed beam ceilings, custom kitchen & applianc"
"Privately gated custom estate on over 3 acres! Formal entry with new custom doors, marble floors & a grand split staircase with exquisite wrought iron work. Gourmet kitchen with built-ins and a Butlers pantry. The Theater room boasts a 108 inch screen and 4 50'' TV's where you can view 5 events at the same time. The resort style pool has a waterfall feature, a toddler pool, half bath, an outdoor kitchen, covered patio, fire-pit & a spectacular panoramic view. There is also a 100 outdoor screen &"
"HAWARDEN HILLS- OLDE HAWARDEN DRIVE- Located on the most exclusive block of what is considered Riverside's most exclusive street, this incredible, completely bespoke estate residence articulated in an elegant Italianate style may arguably be Riverside's most prestigious address! Crafted with the utmost of care, quality and design, the property leaves its occupants in want of nothing more than the perfection possessed within the walls of this gated compound. Possessing such high standard of mater"
"Park Like, Near Historical areas, Great View of El Cajon, Close to University of Riverside California, Close to Fairmont Park, Freeway Access 60,91,215, Sought, Close to Mission Inn, City Hall..Downtown Riverside with in 1 mile. County Administrative Center, Prime Location. Ready for Development. Available for Rezoning!! Developers/Investors Dream!! Block of Market Street, Two Blocks from Main Street!! Near 9th District Courthouse, Bankruptcy Courthouse. Near Sherman Institute. 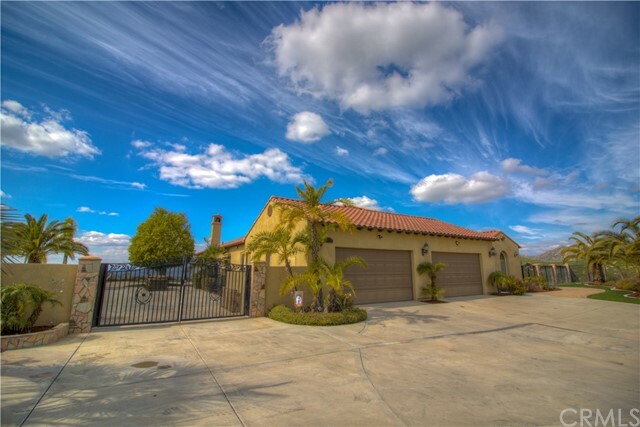 Near Cal Baptist "
"ULTIMATE CUSTOM VIEW HOME. Known as the White House Located in Wyndham Hill Estates. 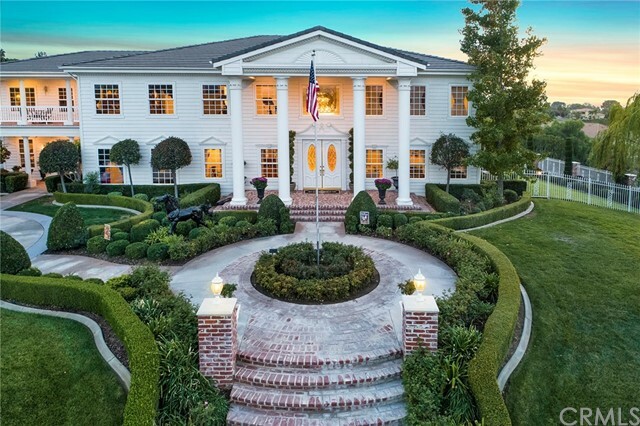 You enter into a 2 story formal entry that boasts of White carrara marble flooring, a living room with a 25'+ ceiling and fireplace, a formal dining room with a built in china cabinet and butlers pantry. Hand painted murals and ceilings by Tiffany Brooks. Open concept kitchen and family room. Kitchen has newly remodeled cabinets, a massive kitchen island, an eat-in area, a large bar and built in desk. 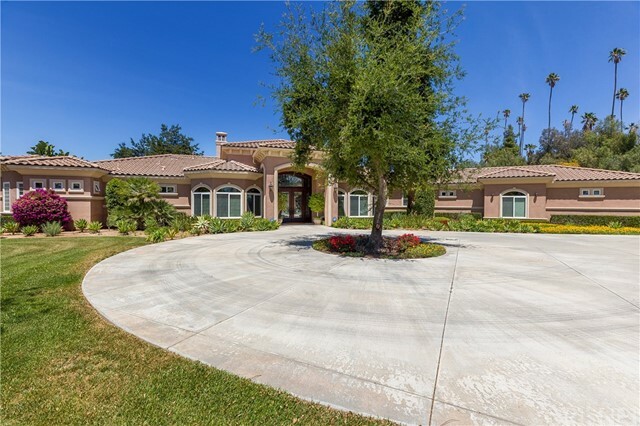 Family roo"
" LUXURIOUS ESTATE WITH SPECTACULAR VIEW Located in the historic orange grove greenbelt near the CA Citrus State Historic Park. 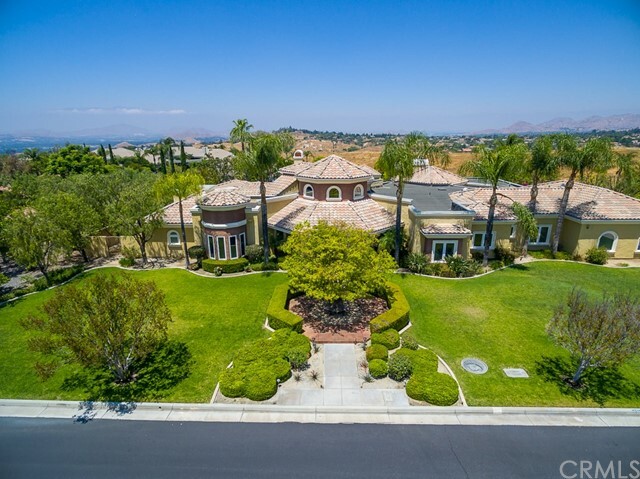 This remarkable Mediterranean style custom-built estate sits on an elevated 4.61 acre lot with amazing 300 views of the orange groves, palm trees, inland valley, city lights and mountains beyond. 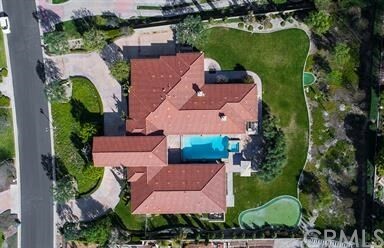 Main residence is over 5,400 sqft of pure elegance encompassing a magnificent formal dining room with fireplace and dramatic 2"
"This exquisite custom built 6bd/6ba home located in Prestigious Crystal Ridge nestled at the top of the hill. City light views from almost every room. Top of the line modern upgrades throughout. Master bedroom downstairs includes fireplace, two walk-in closets, a spa tub, double sinks, and large double faucet steam shower. Additional bdrm/office with custom built in cabinets located downstairs. 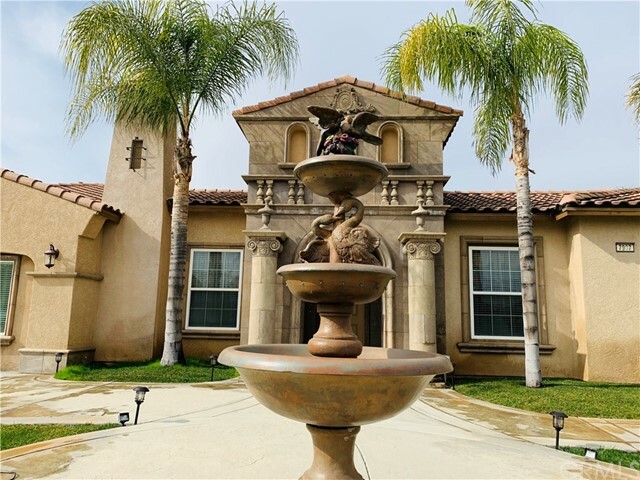 As you make your way throughout, you will notice the gorgeous wrought iron wood staircase leading up t"
"Elegant hilltop home designed in the image of an Italian Villa. Pass through the gate of this spectacular 2.64 acre property and travel up the private driveway and meander through a grove with hundreds of avocado trees. The owner/builder designed this home ith all features and amenities imaginable, including a detached guest quarters (with kitchen, bath, bedroom, living room). The main house features a wine cellar, multiple fireplaces and gourmet kitchen (with subzero refrigerator/3 ovens/2 dish"
"MUST SEE...Beautiful single story spectacular Italianate style custom built gate guarded estate on an elevated 1.01 acre home located in one of the most exclusive communities of Riverside- Hawarden Summit. quality craftsmanship throughout. main residence measures close to 6000 sqft. of elegant living space, offers 5 bedrooms, 4.5 bathrooms, private gym can be convert into 5th bedroom, separate home office with wood-paneled library, relaxing game room with wet bar and billiards, surround sound sy"
"HAWARDEN SUMMIT- Stunning ultra-custom single level residence exuding high quality construction and tastefully current finishes and decor! Dramatic foyer draws your eye inward to the spacious formal living room with soaring box beamed ceilings and expansive windows offering panoramic views of the backyard and city lights and mountains beyond. Large formal dining room; striking wet bar/butler's pantry; completely remodeled kitchen with custom cabinetry, white Carrara marble counter-tops, professi"
"Stunning Arlington Heights Estate on 2.92 acres of orchard property & Gage Canal Shares. You are first greeted by the automatic gate through the extended driveway surrounded by luscious plant life. As you come up to the house you have a circular driveway with a 5 car garage attached to the main house, 3 covered carport spaces, and a 2 car garage attached to the guest house that is RV accessible. 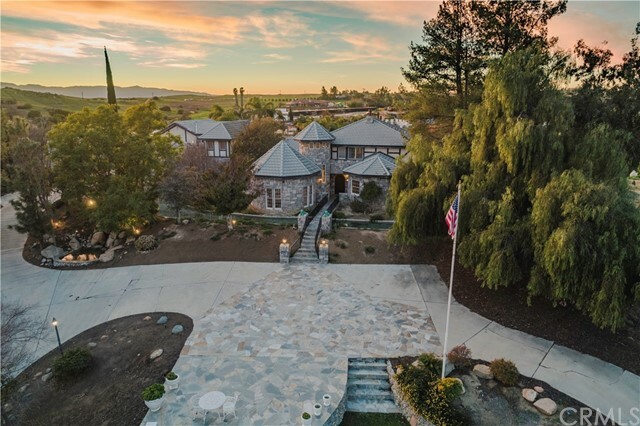 As you enter the custom designed Inside Story by Si Iverson you will be amazed by the exquisite home "
"This Mockingbird Canyon Estate is on 2.4 Acres. Property has 8,893 SF of living space w/ 2 residences, 3 bars, multiple garages, RV garage & outbuildings, over 2700 sq ft of storage, & ready to build another residence on lower lot w/ electricity, septic & dump station. Upper Lot features an entertainment pavilion that can accommodate 250+ guests. In addition the exterior has immense open space & includes private gardens & patios, lush lawn & gazebo, salt water pool w/ waterfall & flagstone, tenn"
"Exquisite gated private estate.Main house(4943 Sqft) features wine cellar, office, den, 4 fireplaces, picture windows, custom cabinets, marble, terra cotta, oak flooring, hand painted walls & ceilings, Pella dual pane windows, teak interior doors. Detached structure(4070 Sqft) includes RV size garage w/loft, workshop, recreation room w/full room, bath, bar, fireplace & a studio w/full bath, loft, kitchenette, fireplace & side yard. Pool, lanai with fireplace & bar, fountains, pergolas, patio, f"
"CANYON CREST - SYCAMORE PARK ESTATES - Designed by Charles Brown and built custom by Jim Guthrie, this residence enjoys unobdstructed 270 degree views from atop Sycamore Canyon Wilderness Park. Constructed for the current original owners utilizing the finest materials, amenities and attention to detail, this property offers all the best there is to living in a truly luxurious environment. Main house consists of 4 bedroom suites all with private baths; Formal living and dining rooms with genuine "
"Stunning single story home located in Whitegates/Hawarden area. 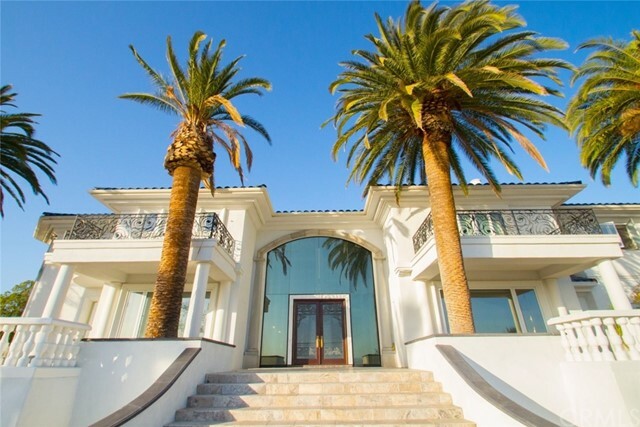 This Mediterranean Beauty was designed for comfort and elegance and offers unparalleled California living. 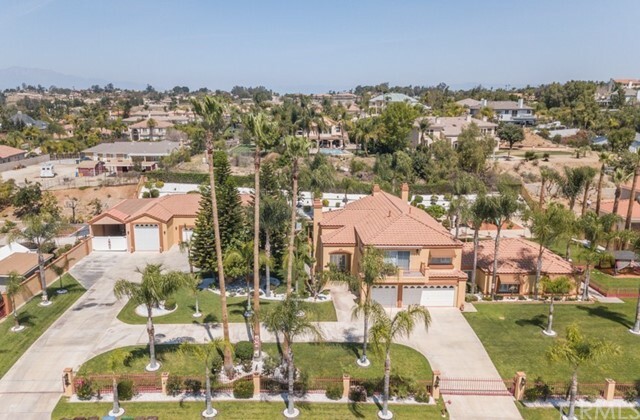 This home offers over 4200 sf living area, 4/5 bedrooms, office, 4.5 baths and an additional 800+, completely self-contained custom Casita and 3 fireplaces. This home is located on 2.25 acres quiet a cul-de-sac and sits atop a knoll for 180 degree valley/city view. A spacious courtyard with Tuscany stone and brick walkways that"
"VIEWS, VIEWS, VIEWS! SOLAR! Stunning one of a kind Hawarden Summit Home. Private Orange Grove. Infiniti Pool and Spa. Formal Living Room and Dining Room. Entertainers Kitchen with Granite Counter Tops, Pantry, and Breakfast Nook. Main Floor Master Suite includes Fireplace, Round Shower, Roman Tub, Walk in Closet and Extra Room that can be used as a Gym, Pool Room or Office. There is a main floor secondary bedroom with full bath and walk in closet. Laundry on Main Floor. Upstairs features 2 Full "
"This 5 bedroom, 5 bath home in a prestigious community of Riverside offers 4,400 sq. ft. of living space resting on over an acre of carefully manicured land. Dramatic foyer with exquisite taste that include a mosaic design, cathedral ceiling and custom staircase with intricate details. The lower level includes the office, formal living room and dining room with 2 bedrooms, 3 bathrooms. Enter the carefully laid out kitchen perfect for large family or corporate gatherings with stainless steal appl"
"JUST REDUCED 50K ESTATES OF CANYON CREST LOCATION! LOCATION! TOP OF THE HILL! 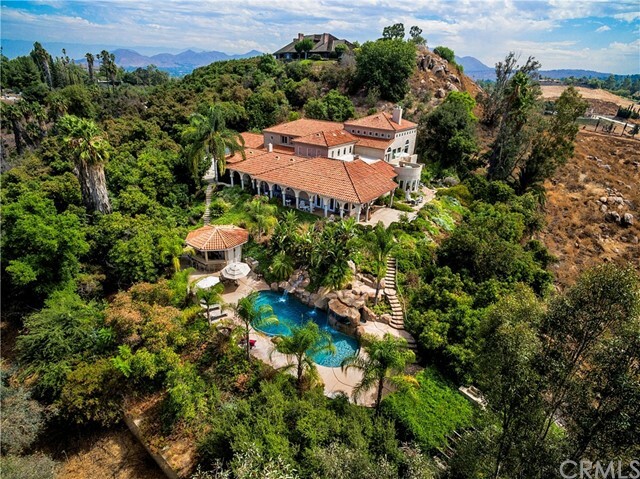 BREATH TAKING ESTATE! FABULOUS HILLTOP ESTATE VIEWS,VIEWS, VIEWS! INFINITY POOL W/ 2 SPAS. SPORT COURT, COVERED BBQ AREA. INSIDE HAS BEAUTIFUL LIMESTONE COLUMNS, STONE, TRAVERTINE, HARDWOOD FLOORS, GRANITE, AND MARBLE GALORE. GOURMET KITCHEN IS AN ENTERTAINERS DELIGHT. FOUNTAINS, WITH A CHILD'S PLAY YARD BIG ORCHARD OF TREES TO GRACE THIS AMAZING PROPERTY! THIS HOME HAS EVERYTHING A FAMILY W"
"7500 SQFT(HOUSE + GARAGE) on over 40000 sqft flat and usable lot with mountain and city light view. Gated Executive Estate located at prestigious Whitegate/Alessandro Heights with swimming pool, 6 Car Garage and a RV garage(can park additional 6 cars). Home features 6 bedrooms, 3 living areas, an office and a bonus room. Enter into formal living room with fireplace, ceiling fan and trey ceiling. Formal dining room features built in hutch, custom chandelier, wine room with direct access to center"
"Welcome home! 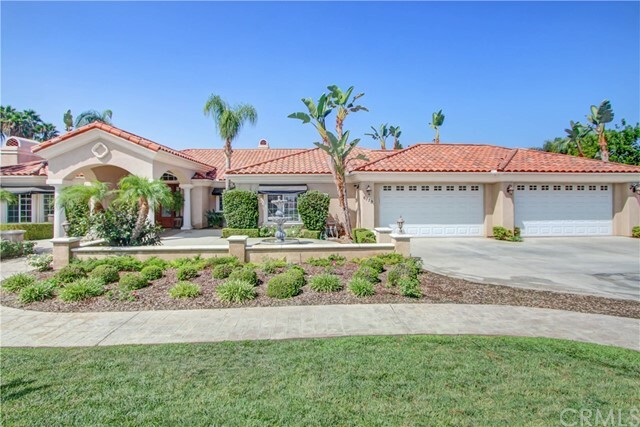 This custom, gated, mulit-family estate is located in Woodcrest neighborhood and sits on almost a 1 acre lot. Over 3,860 sqft of living space with 5 Bedrooms and 5 Baths! Enter the beveled glass double door entry to stunning cathedral ceilings with chandeliers and a beautiful staircase leading upstairs Formal living is open to the formal dining. Spacious kitchen perfect for entertaining as it's open to the family room. Large laundry room and 1 full bath downstairs. Just up the stai"
"Reduced! 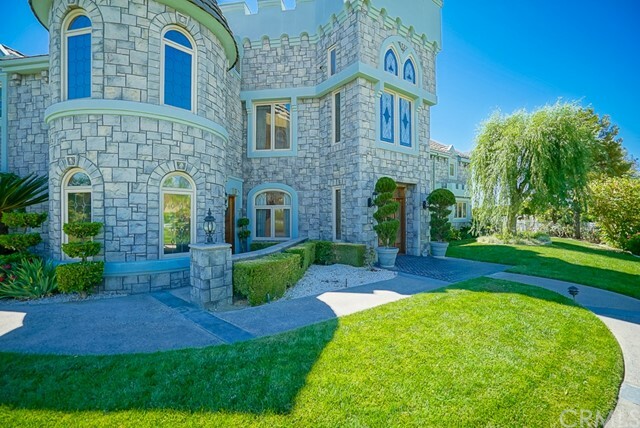 YOUR HOME IS YOUR CASTLE and in this case it is a real Castle. One of a kind custom with 2.75 acres and includes a running stream in the rear of the property. Newly remolded kitchen has new granite countertops and flooring, all new upgraded Appliances, large walk in pantry, center cooking island and eating island adjoining the family room. When you enter this beautiful home you are greeted with a nearly 30 ft high ceiling with a enormous skylight to view the stars at night. 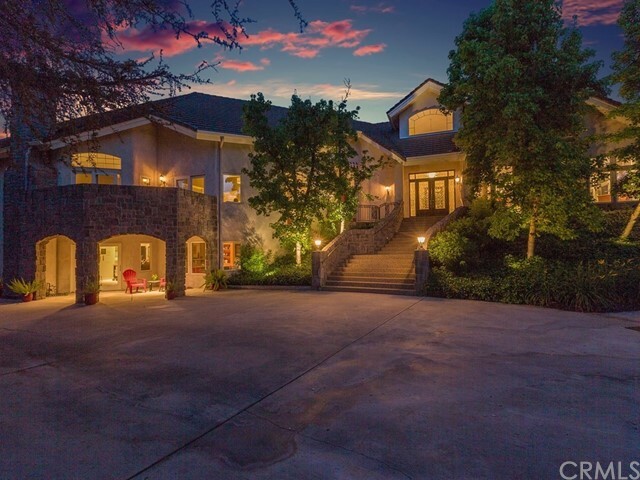 The sweeping"
"Luxury at its finest in this distinctive estate on over an acre with stunning panoramic mountain & city lights views! 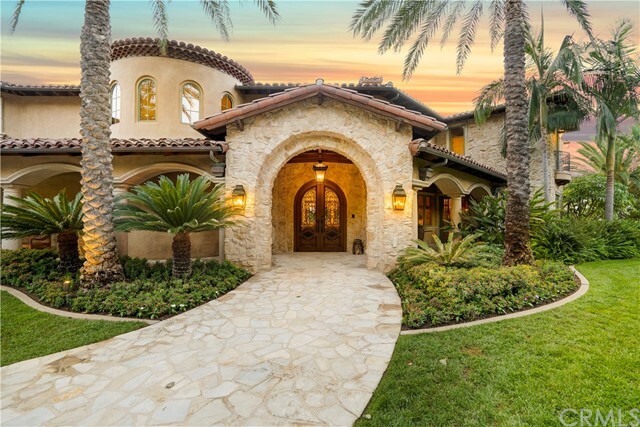 The private, gated courtyard leads to a handcrafted, arched front door & formal entry that invites you to the spacious formal living room with marble floors, high ceilings, & over-sized windows to take in the jaw-dropping views. The bright & airy formal dining room features French doors that open to a covered patio. The gourmet kitchen is the envy of any chef with high-end stainl"
"Timeless, modern, sophisticated & luxurious. Impossible to pick just one to describe this Ultra-Custom Estate in Riverside s historic Greenbelt. Situated on 1.66 acres & nestled among dozens of 50+ year old Oak & Pine trees, this property offers a level of privacy and tree dense seclusion not found in Riverside. The grounds are fully irrigated & professionally landscaped to enhance every angle multiple seating vignettes, arbors, covered patios that span the length o"
"BEAUTIFUL RIVERSIDE WHITEGATE AREA CUSTOM BUILT VICTORIAN ESTATE DREAM HOME. YOU WILL BE CAPTIVATED BY THE FABULOUS UPGRADES THROUGH OUT THE ENTIRE ESTATE. 6 BEDROOMS 6 BATHROOMS 5140 SQUARE FEET. A RECENTLY BUILT OVERSIZED 34 FOOT WIDE 50 FOOT DEEP R.V. GARAGE WITH AN ATTACHED ENTERTAINMENT SUITE/GUEST QUARTERS. THIS STRUCTURE ALSO CONTAINS TWO REFRIGERATOR AREAS, FULL BAR, TWO COMPLETE BATHROOMS, R.V. DUMPING STATION, 100 AMP POWER CIRCUIT/PLUG AND A BASKETBALL COURT. THE HOME HAS A SOLAR PANE"